Paul Green shoots Oldham ahead from the penalty spot. Photo: Joe Dent/theposh.com. Peterborough United slipped to rather embarrassing League One defeat at relegation-threatened Oldham tonight (January 24). The home side, who had scored just 13 goals in 26 League One matches before this game at Boundary Park, won 2-0 thanks to a 67th minute penalty from Paul Green and an 82nd minute tap in from Ryan McLaughlin. Posh substitute Leo Da Silva Lopes tries to get away from Oldham's Ollie Banks. Photo: Joe Dent/theposh.com. It was no more than Oldham deserved. They lack quality, but they were better than a Posh side who didn’t muster a shot in anger apart from a Michael Bostwick free kick that was slammed straight at home ‘keeper Connor Ripley on the hour mark and an injury time effort from Marcus Maddison that struck the crossbar. Oldham were so superior, potty-mouthed manager John Sheridan left the swear box empty tonight. Must of the pre-match chatter in the crowd revolved around Oldham’s lack of goals, lack of quality and lack of hope. There was at least a relatively big crowd thanks to the home club’s policy of free admission, although one suspects many probably still felt over-charged at half-time, such was the dire standard of play on an atrocious playing surface. Posh star Marcus Maddison takes on Oldham's Jamie Reckford. Photo: Joe Dent/theposh.com. 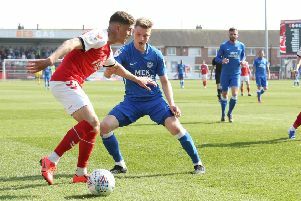 As Posh boss Grant McCann predicted Oldham were aggressive and physical and the visiting players in an unchanged starting line-up didn’t enjoy the close-marking attention as they tried to bring the ball down and play, an impossible task for both sides. Clearcut chances were absent for 45 minutes with Oldham skipper Peter Clarke hooking the ball over the bar on 31 minutes the best opportunity. Clarke, a centre-back, is Oldham’s top scorer. Posh started to come to grips with the surface after about 20 minutes of mis-control and constant fouling, but Maddison’s inability to beat the first man from a set-piece ensured McCann’s men created absolutely nothing. Indeed only when home ‘keeper Connor Ripley fumbled a Maddison corner did the heart beat a little faster. Faster then the reaction of any Posh player as Ripley recovered to grab the ball. Oldham also started the second-half the better and there were enough goalmouth scrambles in the Posh penalty to suspect a goal was coming. It took a spot-kick awarded by fussy referee Michael Salisbury to give Green the chance to score the vital goal by sending Luke McGee the wrong way. The foul, the fouler and the victim weren’t obvious, but Posh players didn’t protest too much when the excellent Ryan Flynn’s left wing cross caused the panic. Sadly there was no response. Oldham’s second goal when the powerful Amadi-Holloway crossed for McLaughlin was throughly deserved. Posh saved their best until last when Maddison’s superb 25 yarder clipped the top of the crossbar. Posh: Luke McGee, Michael Smith, Andrew Hughes, Dominic Ball, Ryan Tafazolli, Michael Bostwick, Chris Forrester, Gwion Edwards (sub Leo Da Silva Lopes, 60 mins), Marcus Maddison, Lee Angol (sub Paul Taylor, 60 mins), Tom Nichols (sub Junior Morias, 74 mins). Unused substitutes: Mark Tyler, Martin Samuelsen, Brad Inman, Jerome Binnom-Williams. Oldham: Connor Ripley, Jamie Reckord, Brian Wilson, Anthony Gerrard, Peter Clarke, Ryan Flynn, Aaron Amadi-Holloway (sub Michael Ngoo, 87 mins), Ousmane Fane, Ryan McLaughlin (sub Billy McKay, 87 mins), Paul Green, Ollie Banks. Unused substitutes: Chris Kettings. Josh Law, George Edmundson, Kallum Mantack, Lee Erwin. Goals: Oldham - Green (pen, 69 mins), McLaughlin (82 mins). Cautions: Oldham - Amadi-Holloway (foul), Gerrard (foul), Flynn (foul).